“A great mix of technology and market outlook. The workshop provided insight into the digital transformation and the drivers behind it,” says Morten Hagland Hansen, VP Segment Market Management Energy at SES, the world-leading satellite operator. 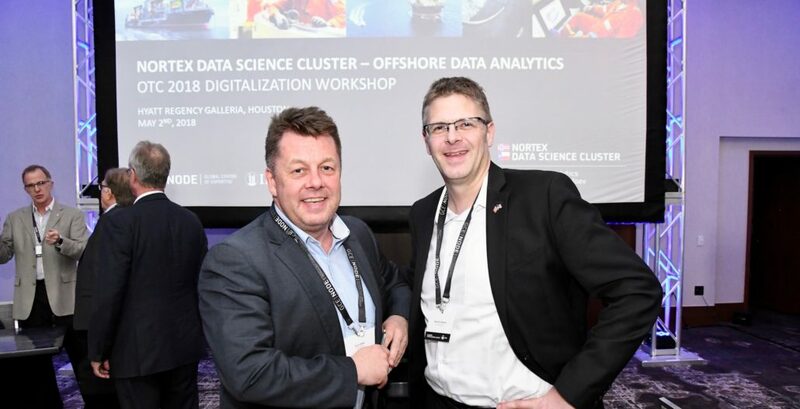 Hansen was a returning participant at the NorTex Data Science Cluster OTC workshop on digitalization. “Both last year’s and this year’s workshops were positive experiences. At SES we are eager to understanding the needs of the end user. What is the demand for communication services in the age of autonomous systems and the Internet of Things? We had very good presentations and useful group discussions at the workshop,” says Hansen. He was among the more than 40 participants, predominantly from the US and Norway. Speakers included representatives from Telenor Maritime, Kongsberg Digital, IRIS, Cognite, Data Gumbo, Apache Corporation and Intellicess. “This is the third NorTex digitalization workshop. We are pleased to see many returning attendees. In addition to learning from each other, we are building trust and good relationships over the years. The value of relationships, has as much value as the technology talks,” says Arnt Aske, Business Development Digitalization at GCE NODE. He thought the workshop included some very good presentations from a technology stand point. “The key point is always how to extract value from new technology. Technology can help decrease cost and increase revenue. Our focus should never stray from value creation,” says Aske.